This Demonstration explores the spatial symmetries of the naphthalene molecule and relates them to electronic and optical properties. The naphthalene carbon skeleton is used to select the electron basis functions in the block-diagonal matrix Hamiltonian of the molecule in Hückel molecular-orbital theory. Each block in the matrix corresponds to some irreducible representation for classification of the energy levels. We also determine the single-electron electric dipole transitions allowed by symmetry for two mutually perpendicular polarizations ( and ) of the incident radiation. In this Demonstration, you can change the strength of the central bond and transform the initial atomic ring of 10 carbon atoms into two rings sharing one carbon bond , with two carbon atoms situated at each end of this bond. The remaining bond strengths are set equal to , thereby neglecting carbon-bond conjugation. Analytical solutions for a 3×3 block of the matrix Hamiltonian correspond to irreducible representations and , as found using Wolfram Mathematica. Snapshot 1: The carbon skeleton and the elements of symmetry of the naphthalene molecule belonging to the point symmetry group . 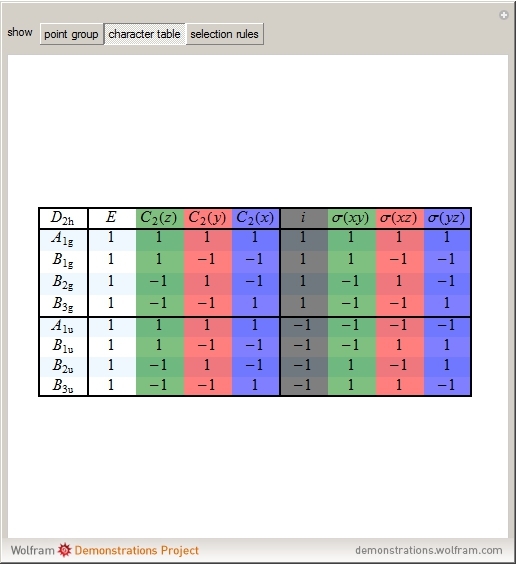 Snapshot 2: The character table for the point group. The column colors label group classes, corresponding to the elements of symmetry in Snapshot 1. 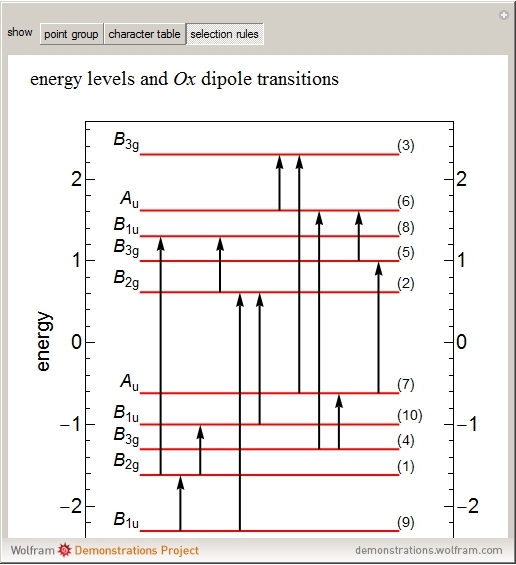 Snapshot 3: Assignment of irreducible representations to the energy levels of naphthalene molecule and the symmetry allowed by electric dipole transitions. 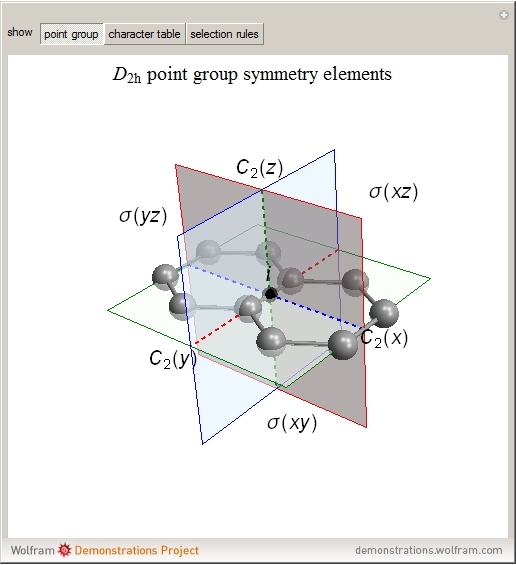 Simply click the plot to switch between - and -polarizations. The wavefunctions of the energy levels can be shown using tooltips, with the mouse hovering over the energy level lines. The wavefunctions for the initial and final states are shown when the mouse is over a dipole transition arrow. The analytical treatment of the electronic energy levels of naphthalene and biphenyl (diphenyl) molecules within the Hückel molecular-orbital theory can be found in . The recursive analytical technique used in , however, does not allow classification of energy levels with irreducible representations of point group . Nevertheless, recursive techniques, such as in [1, 2], and the transfer matrix method  can provide solutions not only for the naphthalene molecule but also for similarly coupled atomic rings with a larger number of atoms. Such generalizations, for example, have been reported for biphenyl-like coupled atomic rings with an arbitrary number of atoms . The symmetry and optical selection rules of naphthalene, anthracene and other molecules from the polyacene series can be found in . The character table presented in the "character table" tab was adapted from . For naphthalene, all dipole transitions with polarization, that is, perpendicular to the plane of the molecule, are naturally forbidden, therefore not shown. J. E. Lennard-Jones and J. Turkevich, "The Electronic Structure of Some Polyenes and Aromatic Molecules. II–The Nature of the Links of Some Aromatic Molecules," Proceedings of the Royal Society of London A: Mathematical, Physical and Engineering Sciences, 158(894), 1938 pp. 297–305. doi:10.1098/rspa.1937.0021. C. A. Coulson, "The Electronic Structure of Some Polyenes and Aromatic Molecules. IV. The Nature of the Links of Certain Free Radicals," Proceedings of the Royal Society A: Mathematical, Physical and Engineering Sciences, 164(918), 1938 pp. 383–396. doi:10.1098/rspa.1938.0024. V. A. Saroka, "Analytical Solutions for Energies and Wave Functions of Two Coupled Quantum Rings in Tight-Binding Model," in Actual Problems of Radiophyics, Proceedings of the VII International Conference (APR–2017), Tomsk, Russia, London: Red Square Scientific, 2018 pp. 5–9. books.google.ru/books?id=QsBdDwAAQBAJ&pg=PA5&hl=ru&source=gbs_toc _r&cad=3#v=onepage&q&f=false. C. A. Coulson, "Excited Electronic Levels in Conjugated Molecules: I. Long Wavelength Ultra-Violet Absorption of Naphthalene, Anthracene and Homologs," Proceedings of the Physical Society, 60(3), 1948 pp. 257–269. doi:10.1088/0959-5309/60/3/305. "Symmetry, Energy Levels and Optical Selection Rules for Naphthalene Molecule"